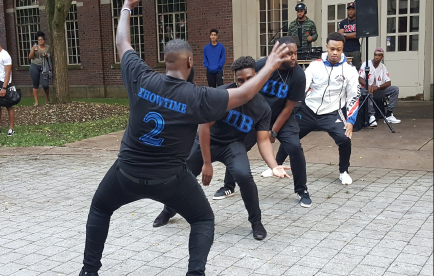 Photo Credit/ Charlese Freeman Phi Beta Sigma Fraternity strolling and having fun. Rather you like shimming or party walking, fraternities and sororities have been using the art of dance for generations to express themselves. The message behind the movements are far bigger than putting on a good show. Stepping and Strolling are the physical manifestations of both sisterhood and brotherhood for many fraternities and sororities on campuses across the nation. Many people tend to confuse stepping and strolling or simply use them interchangeably, but they are different entities. Stepping is the art of creating a rhythmic beat utilizing the entire body— clapping or stomping or both. Some sororities and fraternities chose to create unique chants to complement their sharp moves. Creating the beat is one thing, but staying on beat is another, these are crucial in mastering stepping. Stepping is not specifically owned by Black Greek Letter Organizations. However, of the Nine Black Greek Letter Organizations of The National Pan-Hellenic Council, Referred to as the “Divine Nine”, including, Kappa Alpha Psi, Omega Psi Phi, Alpha Kappa Alpha, Delta Sigma Theta, and Zeta Phi Beta, Alpha Phi Alpha, Phi Beta Sigma, Sigma Gamma Rho, and Iota Phi Theta, Phi Beta Sigma Fraternity Inc. was the first Greek Organization to adopt stepping, thus labelling them as the first “steppers”. Modern stepping has evolved into a uniformed yet individualized way to create the same beat. On the other hand, strolling is a synchronized modern dance style that many fraternities and sororities have come to embrace. Each fraternity and sorority developed unique moves. However, Strolling has taken over. While stepping is still very common and relevant, strolling creates an entirely new experience when people hear familiar or intriguing music, accompanied by powerful dance moves. The origin of stepping and strolling mimic dance styles and traditions with African roots. A number of organizations use ideas and styles from African tribes and incorporate them into different body movements. Many assume that all the members of the organization who choose to step or stroll have an acute sense of rhythm and style. Why let the guys have all the fun? Sororities appreciate the culture behind stepping and strolling just as much as fraternities. The Kappa Shimmy or the Sigma Walk— the style makes no difference—the members of Sororities and Fraternities step and stroll as a cultural and ultimate sign of comradery and cultural praise.